I am only now getting acquainted with the writings of Neil Vermillion. He writes as a prophet of God to encourage the people of God. Some do not believe in such, but I do. I believe that any word we speak to encourage others in Christ better be from the heart of God, for only there is truth found for any situation, and that, beloved, is the heart of prophesy. True prophesy is always linked to the character, sovereignty and truth of God and His Word, for prophet and prophesy cannot stand apart from Him. True prophesy always leads the hearer to faith in God alone. 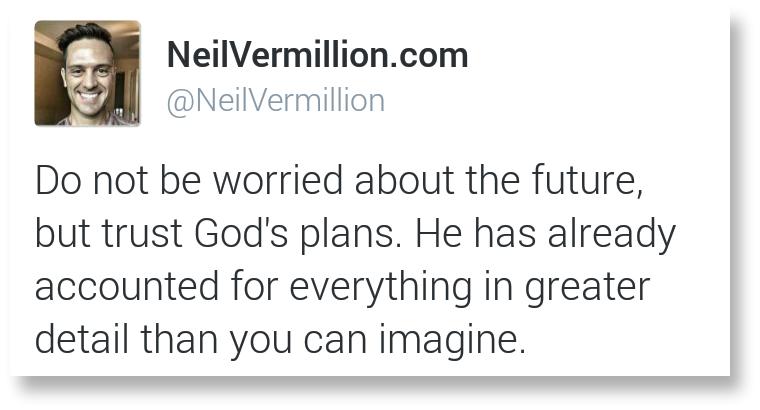 Neil Vermillion ministers a heart of faith in his posts, and in the few days of my time with him, God has helped me through his words. Meet Neil at Daily Prophetic Word.